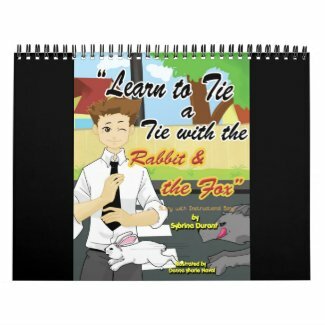 At last, the enchanting age old story of the rabbit and the fox is available for teaching the art of tying a simple, yet elegant knot in a tie. For generations, this endearing old world mnemonic* was passed from father to son by word of mouth only. Unfortunately, it has become all but lost to the minds of present-day well-dressed men and women. Now, this clever memory jogger has been revived for the benefit of all future members of the tie wearing society. After reading about the rabbit’s flight from the fox you will never again be at a loss as to how to tie this basic knot. Note the italicized instructions through-out the story as you follow the easy step-by-step illustrations. Within moments, he will feel like an expert and will look like a professional in his tie. *Mnemonic—The art of memorizing something by associating it with words, phrases or sentences which have been especially designed to help you REMEMBER. Deep in the Woods of Tie Land a little rabbit lived snug as a bug in a cool dark hole which had long been deserted by some sort of digging creature. The little rabbit enjoyed sleeping in that nice cozy place far from the rays of the blazing sun until late in the evening when he would come out and forage for some juicy shoots and tender morsels to eat. One afternoon the little rabbit strayed farther away from the safety of his home than he normally did. At the base of a large tree he had discovered some of the tenderest, juiciest shoots he had ever tasted. So loud was his munching and so intent was his enjoyment of the feast that he failed to hear the soft padding of footsteps approaching from behind. Then, there was an abrupt snapping of a twig and suddenly the little rabbit found himself face to face with a quick gray fox. For a moment the little rabbit froze, his tiny heart pounding like a big fist in his chest as the quick gray fox surveyed the possibilities of having a tender rabbit for his own dinner. Send This Webpage To Everyone You Know. Parents and their children can now enjoy learning to tie a tie together with this video or with the new full color story book. Make it a fun activity for all participants. If you have some old ties that have been hanging in the closet for years, grab one for each person and follow along as you watch the animated video or as you’re reading the book. Note: The Rabbit and the Fox method of tying a tie, is formally known as the “Four In Hand”, which produces a small asymmetrical knot. It is believed to be the most popular method of tying a tie because it is simple and easy to learn. Easy enough, in fact, for a very young child to quickly master. The Four In Hand is also known as a “simple knot” or a “school boy knot”. It may be a simple knot but it allows for a very nice dimple. This is a subtle crease that sits just below the knot and allows the tie to gently billow. Gathering his senses about him, the rabbit bounded away with the fox snapping at his cotton tail. Once around the tree, the fox chased the rabbit. Twice around the tree the little rabbit fled with the quick gray fox close behind. Trying to shake the persistent fox, the rabbit scooted under a bush. The fox, being too large, lost time struggling under the bush. And dove right into the safety of his cool, dark hole. The quick gray fox wasn’t quite quick enough. He wouldn’t be dining on rabbit that evening. Buy the full color family activity book! You will love the disneyesque yet modern artwork. The book contains 24 pages of story, instruction and tie-a-tie diagrams plus song lyrics. Click here to read the story book version of the song lyrics and listen to the song for free. Click a link below for information about the book in English, Spanish or Tagalog, or the How To Guide For Older Guys. And check out these learn to tie books created especially for GIRLS Here & Here.